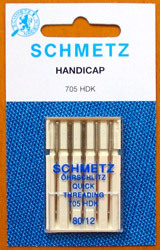 New Schmetz needle for anyone having difficulty threading a sewing machine needle. To the right side of the needle eye is a small incision to allow the thread to be clipped into the eye. Size 80s only.